With the temperatures dipping into the teens a few days before Christmas this year, it is hard to imagine just how popular an outdoor venue Washington County Park on the Jersey City/Union City border is during other seasons. “People come here from all over,” said Nick Caballero, president of the Washington Park Association (WPA), which is spearheading an $808,000 upgrade to the picnic area and a number of future changes that will make the park look even more appealing. One of seven county parks, Washington Park is 100 years old and 22 acres. The WPA was founded in 2008 by a group of residents in the vicinity of the park. Their goal was to create opportunities for positive change in the park which in turn would improve the surrounding neighborhoods and create a stronger sense of place for area residents. The WPA says its purpose is to work with the community to revitalize, maintain and protect Washington Park, and promote its use through the development of programs and activities that enhance the quality of life of park users and local residents. To the whine of backhoes and the rattle of jackhammers, officials from Jersey City, Union City and Hudson County gathered on Second Street recently to hold an official groundbreaking, although contractors have been on site for several weeks, demolishing the old picnic area in preparation for reconstruction. 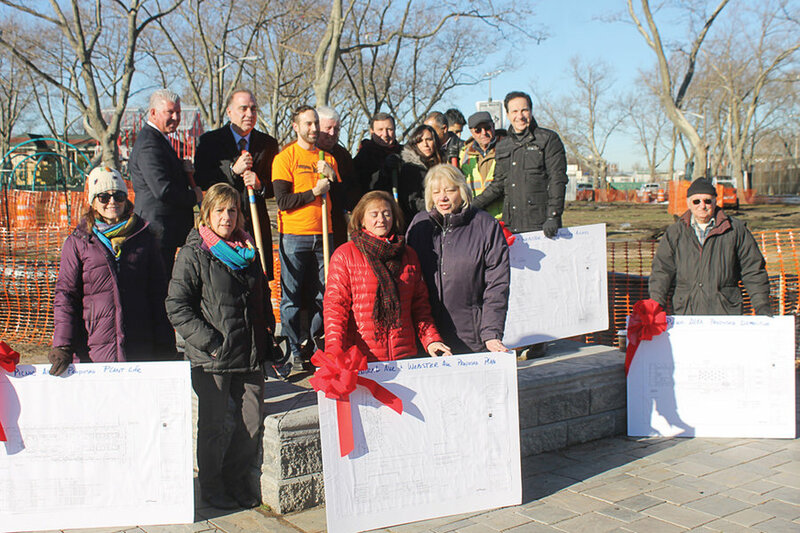 The project for improvements to Washington and Lincoln Parks is a public-private partnership between the Washington Park Association of Hudson County, a non-profit organization based in Jersey City, the state of New Jersey, and Hudson County. The project is funded through the New Jersey Green Acres Program and the Hudson County Open Space and Historic Preservation Trust Fund. “The WPA has been working on this project since 2010 when we wrote and won a state Green Acres grant and we have almost tripled our funding to make the much needed updates,” said Caballero. The group began other fundraising for the project in 2012. Charlene Burke, a member of the Jersey City Parks Coalition who helped draft the grant application, said the project was spearheaded by the Washington Park Association. Shared by Union City and Jersey City, Washington Park serves as a significant hub for recreational activity. The county rents a portion of the park to Union City that runs along Palisades Avenue and provides sports fields with a modest recreational element. But the rest of the park, both on the Union City and Jersey City side of Paterson Plank Road is owned and maintained Hudson County. The Jersey City side has sports fields and passive recreation. The Union City portion run by the county has tennis courts, ball fields, and playgrounds as well as passive recreation. The picnic area is between the tennis courts and playgrounds near Second Street in Union City. “During the summer, this place is filled with people from Union City and Jersey City,” said County Executive Tom DeGise, who lives one block from the park in Jersey City Heights and is a frequent visitor to the park. Freeholder Anthony Romano said residents from Hoboken also make use of the park and its picnic area. Situated near the 14th street viaduct, Washington Park offers views of the New York City skyline. A stainless steel sculpture stands 14 feet high and 35 feet wide at the entrance on Paterson Plank Road. It was created by accomplished artist and Jersey native Chakaia Booker. The park landscape features a large trellis sculpture, two gazebos, a picnic area, and ornamental gardens. Yet as popular as the picnic area is, the area has seemed rundown over the last decade, its grilling stations rusted, and with a general sense of decline that ordinary maintenance could not alleviate. Caballero said the WPA has helped by landscaping throughout the park, designing gardens, working with groups to maintain them. The picnic area is part of the park’s image that will include the construction of a new entrance, and will provide a venue, not merely for picnickers, but also music lovers with the construction of a band shell. DeGise said the park and picnic area are a valuable resource to local residents who may not be able to afford to take vacations to places such as the Jersey Shore. “People who come here are well-behaved,” he said. The plans for the new area were done by Rutherford-based MKW landscaping and the project calls for new pathways, new fire pits, signage and other amenities. New disability access entrances and signage are also being added to park. Some of the funding for park furniture is part of a joint grant awarded to both Washington Park, and Lincoln Park, the county park on the west side of Jersey City. Sandra Carretero of SITA Construction Co., Inc. based in Goshen, NY said her company mobilized in mid-December and expects to have the project completed by spring.